Understanding bacterial translation is of interest to many high school and college biology students, but hands-on research of this process has traditionally been inaccessible because of the expertise required for molecular cloning. There is also a need for more and better translational control elements that can be used for genetic circuits with applications in medicine, biotechnology, bioremediation, and biomaterials. We addressed these needs by inventing, constructing, and testing two new tools called rClone Red and rClone Blue that use Golden Gate Assembly for easy cloning of ribosome binding sites (RBSs), which control the initiation of translation. We validated rClone Red for student research by building libraries of mutated RBSs, selecting members of the library, determining their sequences, and measuring their strengths using a red fluorescence protein reporter gene (RFP). We compiled consensus sequences and tested them in rClone Blue with a blue chromoprotein reporter gene. Because our results showed higher RBS strengths for the blue chromoprotein gene than for the RFP gene, we developed and supported a hypothesis that an anti-RBS sequence was present in the RFP gene that sequestered the RBS with intramolecular mRNA base pairing. We demonstrated that rClone Red and rClone Blue are student-friendly research tools for mutational analysis of bacterial RBSs. In addition, we increased the number of RBS and bicistronic RBS elements for use in genetic circuits. We submitted 65 RBS and 62 bicistronic RBS sequences to the Registry of Standard Biological Parts to make them available to the worldwide synthetic biology research community. Gene expression, the process by which the inherited information of genes is used to direct the function of cells, is regulated in all cells because not all genes are needed all the time or under all circumstances (Hijum, Medema, & Kuipers, 2009). Gene expression begins with transcription, the process by which the DNA base sequence of a gene is converted into RNA sequence information. For genes that encode proteins, the messenger RNA (mRNA) product of transcription is used during translation to encode the sequence of amino acids in a protein. The sequence of bases in mRNA is translated by the ribosome, which is composed of a large (50S) and a small (30S) subunit. Translation is initiated when the 16S ribosomal RNA (rRNA) of the small ribosomal subunit base pairs to a conserved sequence in the mRNA, called the ribosome binding site (RBS; Figure 1). Figure 1. The RBS of a mRNA base pairs with the 16S rRNA of the 30S ribosomal subunit. A. Simple RBS (B24 from this study). B. Bicistronic C dog RBS (C10 from this study). Dashed lines indicate hydrogen bonds from paired RNA bases. mRNA = messenger RNA; rRNA = ribosomal RNA; RBS = ribosome binding site; C dog = bicistronic RBS. After the small ribosomal subunit binds to the RBS, the large ribosomal subunit attaches to the small subunit to begin translation of the mRNA into a chain of amino acids. The mRNA bases are read as triplet codons that interact by base pairing with anticodons in transfer RNA (tRNA) molecules, which carry amino acids to the growing protein chain (Malys & McCarthy, 2010). As shown in Figure 1, RNA-RNA base pairing typically involves the Watson-Crick base pairs of G with C, and A with U, but G can also base pair with U. The conventional understanding is that the strength of a given RBS is determined by the strength of its base pairing interactions with the 16S rRNA (Shine & Dalgarno, 1974). In natural bacterial genomes, there is a wide variety of RBS sequences and RBS translational strengths that have resulted from natural selection for global patterns of gene expression. The relationship between RNA base pairing and the strength of an RBS also explains how synthetic RBSs can be produced with widely varying strengths. In addition to intermolecular base pairing, intramolecular base pairing affects the strengths of RBSs. The ability of RNA to engage in intramolecular base pairing is well established (Busan & Weeks, 2013). RBS elements can be disabled by RNA folding, as is the case in riboswitches (Breaker, 2012). The RNA in riboswitches adopts an OFF state when the RBS is bound by a complementary anti-RBS sequence within the mRNA. The addition of a small molecule ligand that binds to the folded RNA changes the RNA shape so that the RBS is available for interaction with the 16S rRNA during the ON state. Understanding the function of RBSs informs the new discipline of synthetic biology, which uses engineering principles and molecular cloning methods for the construction of parts, devices, and systems, with applications in areas such as medicine, energy, and the environment (Khalil & Collins, 2010). Synthetic biologists have studied the function of RBSs as interchangeable parts that retain their strengths in the context of any gene expression device, but the interchangeability of simple RBSs has come under question (Mutalik et al., 2013). An RBS that functions efficiently upstream of one gene will not necessarily function efficiently upstream of a different gene. The C dog bicistronic RBS was intended to solve this inconsistency (Mutalik et al., 2013). As shown in Figure 1, the C dog RBS uses two RBSs to preserve the strength of the second RBS upstream of any gene of interest. The first RBS initiates translation of mRNA into a short leader polypeptide. The coding sequence for the leader polypeptide extends past the second RBS and ends at the start codon of the gene of interest. Translation of the mRNA into the leader polypeptide is hypothesized to disrupt gene-specific mRNA folding that could sequester the second RBS and reduce its strength of translation initiation. We still have more to learn about the translation initiation in natural and synthetic systems. However, mutational analysis of RBSs has historically been challenging for high school and undergraduate researchers, because it requires substantial expertise in molecular cloning methods. For example, the introduction of mutations into bacterial translational control elements usually involves purification of restriction-digested DNA from agarose gels, a method that is difficult to master and time-consuming. In addition, an often complicated strategy involving compatible restriction enzyme sites must be tailored for the assembly of DNA parts during each molecular cloning project. We addressed these two problems with the design, construction, and testing of a new molecular tool called rClone. rClone uses Golden Gate Assembly (GGA), which eliminates the need for gel purification of DNA and enables the standardization of assembly for molecular cloning (Weber et al., 2011). We leveraged the simplicity and reliability of GGA for rClone, which enables the cloning of RBSs, as we did previously for pClone, which enables the cloning of promoters (Campbell et al., 2014). After RBSs and promoters are cloned, rClone and pClone help one measure their function easily using convenient reporter genes. These two plasmids make the mutational analysis of bacterial gene expression faster, cheaper, and more accessible to high school and college student researchers. We demonstrated the power of rClone for RBS mutational analysis by producing libraries of thousands of mutant simple RBSs and C dog RBSs, and investigating the libraries to learn about the sequence requirements for the control of bacterial translation. We used this mutational analysis to address the hypothesis that mutations in both simple RBSs and bicistronic C dog RBSs would affect the efficiency of translation. Our results culminated in consensus sequences that represent new and testable hypotheses about the sequence requirements for RBSs, as well as a collection of 127 new RBSs that can be used by the synthetic biology community. For the construction of rClone Red, we used PCR and GGA to remove a RBS from tClone Red, which we built previously for the study of transcriptional terminators. We built rClone Blue by using PCR and GGA to replace the RFP reporter gene in rClone Red with a reporter gene that encodes a blue chromoprotein. We submitted rClone Red and rClone Blue to the Registry of Standard Biological Parts as part numbers BBa_J119384 and BBa_J119389, respectively (MIT Working Group, 2005; http://parts.igem.org/Part:Bba_J119384; http://parts.igem.org/Part:Bba_J119389). We used rClone Red and rClone Blue to construct four different mutant RBS libraries. We explored the libraries by picking colonies, determining the DNA sequences of the mutant RBSs they carry, and measuring the strengths of the RBSs with the fluorescence produced by the RFP reporter gene. Additional details for the experimental procedures by which we constructed and used rClone Red and rClone Blue can be found in Supplemental Information. rClone plasmids use the type IIs restriction enzyme BsaI and GGA to clone RBSs (Figure 2A). rClone Red contains a “backward facing” Green Fluorescent Protein (GFP) expression cassette between a “forward facing” promoter and a “forward facing” RFP reporter gene. The GFP cassette is flanked by BsaI binding sites. The GFP and the BsaI sites are removed during GGA when BsaI cuts out the GFP cassette, leaving behind sticky ends. Annealed oligonucleotides that encode the RBS to be cloned also have sticky ends complementary to those produced by BsaI digestion of rClone Red. DNA ligase present in the GGA reaction attaches the oligonucleotides that have annealed to rClone Red. Two categories of clones result from the transformation of the GGA reaction into E. coli bacteria (Figure 2B). Transformation of the original rClone Red plasmid results in colonies that express GFP because the GFP cassette is still within the RFP cassette. Successful cloning of a new RBS sequence produces colonies that are not green. The strength of the RBS determines the amount of RFP produced in non-green colonies. Figure 2. rClone Red and rClone Blue allow RBSs to be cloned into a reporter gene expression cassette. A. BsaI and DNA ligase enable cloning of RBSs via GGA. B. Photographs show typical colony colors after GGA with rClone Red (right) or rClone Blue (left). RBS = ribosome binding site; GGA = Golden Gate assembly. Cloning RBSs with rClone Blue works the same way as cloning RBSs with rClone Red (Figure 2A). rClone Blue contains a “backward facing” GFP expression cassette between a “forward” promoter and the AmilCP blue reporter gene. The GFP cassette is flanked by BsaI binding sites and is removed during GGA when BsaI cuts out the GFP cassette, leaving behind sticky ends. An RBS, or a library of RBSs, with complementary sticky ends, can be cloned using GGA. As with rClone Red, green and not green colonies can occur (Figure 2B, left side). Unsuccessful GGA results in green colonies because the GFP cassette was not removed. Colonies that do not express GFP are the products of successful GGA. We used rClone Red and rClone Blue to study simple RBSs and C dog bicistronic RBSs. We developed two mutation strategies for both types of RBSs. One strategy produced 65,536 possible RBS sequences by varying all eight bases of the RBS and replacing them with N’s, where N refers to A, T, C or G. The other strategy preserved the middle two highly conserved bases, resulting in 4,096 different RBS sequences. We constructed libraries using both strategies for the simple RBS (Figure 3A) and the C dog bicistronic RBS (Figure 3B). The strengths of the RBSs determines the amount of blue chromoprotein produced in the non-green bacterial colonies. The strength of a given RBS determines the phenotype of colonies in a library (Figure 4). Colonies that resulted from failed assemblies are green whereas colonies from a successfully cloned RBS are not green. The intensity of the red fluorescence of a colony is determined by the strength of the RBS it contains. A strong RBS results in a visibly red colony whereas a weak RBS results in a colony that is not red. Figure 3. Strategies for mutant RBS library construction. A. Plan for simple RBS libraries. Bottom. B. Plan for C dog libraries. C. List of oligonucleotides ordered for library construction. RBS = ribosome binding site; C dog = bicistronic RBS. Figure 4. Results from rClone experiments. Diagrams show various RBS strengths in rClone Red and photograph is an example of an rClone Red RBS N8 library plate. RBS = ribosome binding site. We explored our simple RBS N6 library by picking 33 clones (Figure 5A). The RBS strengths are expressed as percentages compared to the strongest RBS we found in our libraries, which was C dog mutant C10. The strongest simple RBS we found in the library was RM, with a relative strength of 31.1%. Of the 33 clones we examined, 19 of them had a strength of less than 10%. We also picked 32 mutant clones from the simple RBS N8 library (Figure 5B). The strongest simple RBS among the clones we picked from the N8 library was B24 with a relative strength of 51.3%. Twenty-six of the 32 clones we picked from the simple RBS N8 library had a strength less than 10%. Figure 5. Selected clones from simple RBS mutant libraries. A. Simple RBS N6 library. B. Simple RBS N8 library. Numbers represent the percentage of RFP produced compared to the strongest RBS, C10 in Figure 6. RBS = ribosome binding site. We picked 26 clones from the C dog N6 library (Figure 6A). The strongest one we found in the N6 C dog library was D18, which had a relative strength of 84.9%. Only 3 of the 26 clones had a strength less than 10%. We picked 36 clones from the C dog N8 library (Figure 6B). The strongest C dog RBS we picked from the N8 C dog library was C10, which was the strongest of all the examined RBS clones and it was used as the relative standard for all comparisons. Ten of the 36 clones had a strength less than 10%. Figure 6. Selected clones from C dog RBS mutant libraries. A. C dog N6 library. B. C dog N8 library. Numbers represent the percentage of RFP produced compared to the strongest RBS, C10. RBS = ribosome binding site; C dog = bicistronic RBS. A consensus sequence expresses the frequency at which each base occurs in each position of a DNA or RNA sequence for a library of sequences (Schneider & Stephens, 1990). We used the information from Figures 5 and 6 to construct a weighted consensus (see details in Supplemental Information) sequence for the RBS N6, RBS N8, C dog N6, and C dog N8 libraries, and the results are displayed in Figure 7. Figure 7 also shows a consensus sequence from 149 RBSs in the E. coli genome (Schneider et al., 1990). To validate our consensus sequences, we selected the base with the highest score and the second strongest base if its score was within half a standard deviation of the highest. For example, simple RBS N6 had a consensus formula of CRCGAGGT, where R stands for purine (A or G). Therefore, testing the simple RBS N6 consensus required two sequences: CGCGAGGT (RBS1) and CACGAGGT (RBS2). We cloned each validating consensus sequence into rClone Red and measured their relative RBS strengths (Figure 8). The strengths of the validating consensus clones for simple RBSs are lower than some members of the RBS N6 library from which the consensus was generated. For the simple RBS N8 library, one of the validating clones was weaker than some members of the simple RBS N8 library, but the other validating clone was stronger than all but one of the simple N8 sequences we had tested. For C dog N6, the validating sequence had the second highest score among the tested clones. Of the two C dog N8 validating clones, one was stronger than all of the tested clones and the other was the fifth strongest in its source library. Figure 7. Comparison of RBS consensus sequences. Consensus sequences are shown from simple RBS (left) and C dog (right) libraries and the consensus sequence from 149 naturally occurring E. coli RBSs (top). RBS = ribosome binding site; C dog = bicistronic RBS. We also cloned all of the consensus validating sequences into rClone Red in their reciprocal simple RBS and C dog contexts. We gave consensus testing sequences two-letter abbreviations based on their context and origin, using R for simple RBS and C for C dog RBS. For example, we cloned the consensus validating sequence RBS1, derived from the simple RBS N6 library consensus, into a C dog RBS and called it CR1. Likewise, we tested the validating sequence called Cdog1 as a standalone simple RBS called RC1 (Figure 8). For three of the simple RBS sequences tested in the C dog context, the strength increased by an average of 2.4-fold. All of the C dog RBS sequences decreased by an average of 28-fold when they were tested as simple RBSs. Figure 8. Strengths of consensus validating sequences in simple RBS and C dog RBS contexts. A. Strengths of consensus validating sequences in their original contexts. B. Strengths of consensus validating sequences in the reciprocal contexts. The first letter of each clone name indicates the context in which the sequence is being tested, with R for RBS and C for C dog. The second letter of each clone name indicates the type of library from which the consensus was developed, with R for RBS and C for C dog. Underlined bases vary in a given consensus sequence. Colors highlight related validation sequences. Strength numbers represent the percentage of RFP produced compared to C10 in Figure 6. RBS = ribosome binding site; C dog = bicistronic RBS; RFP = red fluorescent protein. To investigate the interchangeability of simple RBSs and C dog RBSs upstream of a different reporter gene, we cloned all of the consensus validating sequences into rClone Blue (Figure 9). The amount of blue chromoprotein produced was proportional to RBS strengths. We categorized each clone as strong, medium or weak based on how blue the colonies appeared in white light. We used RFP strengths to categorize the same validating sequences when tested in rClone Red. rClone Blue and rClone Red shared three of the five strong validating sequences (CC1, CC2 and CC3). Only two of the five medium validating sequences (RR1 and RR4) and one weak validating sequence (RR3) were shared in rClone Red and rClone Blue. Figure 9. Comparison of consensus sequence validating sequences in rClone Blue (top) and rClone Red (bottom). Clones listed at the bottom are the consensus validating sequences that are shared between rClone Red and rClone Blue. Our results provide support for the hypothesis that base pairing between the 16S rRNA of the ribosome and the RBS affects the strength of a given RBS. The strongest RBSs from all four libraries have an average of 6.75 out of 8 bases pairs with the 16S rRNA. The weakest RBSs from all four libraries have an average of only 2.25 base pairs with the 16S rRNA. Our results also showed that the strengths of simple and C dog RBSs were lower in rClone Red than they were in rClone Blue. We hypothesized that the RFP mRNA has a translation blocking anti-RBS that is absent in the blue chromoprotein mRNA. An anti-RBS within RFP mRNA would explain why many of the validating sequences worked better in rClone Blue than in rClone Red. To investigate the validity of our anti-RBS hypothesis, we explored the possible secondary structures formed in both rClone Red and rClone Blue using a web-based program called mFold (Zuker, 2003). The program searches all the possible intramolecular base pairing interactions for an RNA sequence. It presents the most stable structures and calculates their free energies as ΔG in kcal/mol. Free energies are a measure of the stability of structures and more negative free energies indicate more stable ones. We used mFold to predict the secondary structure and calculate the ΔG for the RC1 RBS in the context of both rClone Red and rClone Blue mRNAs (Figure 10). The RC1 RBS had a strength of only 4.0 in rClone Red but was among the strongest RBSs in rClone Blue (see Figure 9). The mFold results show that in the rClone Red mRNA, the RC1 RBS is base paired to a part of the RFP coding sequence immediately downstream of its start codon, forming a stem and loop structure. The RC1 RBS does not form a stable a stem and loop structure with the blue chromoprotein mRNA. The mFold results support our hypothesis that the RFP gene has an anti-RBS which sequesters simple RBSs and inhibits the initiation of translation. Figure 10. mFold RNA folding analysis of rClone Red and rClone Blue mRNAs. The RC1 RBS forms a stable anti-RBS hairpin in rClone Red but not in rClone blue. mRNA = messenger RNA; RBS = ribosome binding site. We looked for base pairing between the anti-RBS in the RFP coding sequence and each of the consensus validating RBS sequences. Validating sequences that base pair with the 16S rRNA also base pair with the anti-RBS, which explains the preponderance of low strength RBSs in the rClone Red libraries. Every RBS sequence that had the potential to be a high strength RBS also was more likely to interact with the RFP anti-RBS. For example, seven of the eight bases of RC2 can pair with the 16S rRNA and with the anti-RBS. RC2 could be a strong RBS because it base pairs well with the 16S rRNA, but it also binds to the anti-RBS in the RFP mRNA. To test whether the anti-RBS was the cause of the reduced RFP production of rClone Red RBS constructs, we mutated five bases in the three codons predicted to base pair with RC1 without changing the amino acids they encode (Figure 11). Two of the three codons specify serine which can be encoded by six codons. Having six codons to choose from provided more mutational options to reduce base pairing between the RFP mRNA and RC1 RBS. The result of introducing three synonymous codons is called RFP version 2. We used mFold to predict the structure and stability (ΔG) of the encoded mRNA of RFP version 2 and compared it to that of RFP version 1. As shown in Figure 11, the RBS is not sequestered in RFP version 2, and the RFP version 2 stem and loop structure is less stable than that of RFP version 1. We also compared the RFP produced with RC1 in the original rClone Red to the RFP produced with RC1 in rClone Red version 2 encoding RFP version 2. Consistent with the mFold analysis, rClone Red version 2 produced ten times more RFP than rClone Red version 1 when both used the same simple RBS. With a relative RFP production of 36%, RC1 would be moved from the weak category to the medium category in Figure 9. Figure 11. Testing anti-RBS hypothesis to explain reduced RBS function in rClone Red. A. Two versions of RFP mRNA encoding the same three amino acids immediately following the start codon. The underlined letters indicate mutated bases. RNA structure and ΔG were calculated by mFold. B. The percentage of RFP protein produced (relative to C10 in Figure 6) by the two versions of rClone Red. RBS = ribosome binding site; RFP = red fluorescent protein. Our investigation uncovered several new RBS consensus sequences that differ from those published over forty years ago (Shine & Dalgarno, 1974). Because of the modular nature of both rClone plasmids, it was straightforward for us to clone the consensus verifying sequences for simple RBS and C dog RBS in rClone Red and rClone Blue. Because we compared the verifying sequences directly in both plasmids, we uncovered a previously undocumented anti-RBS in the RFP mRNA. When we produced rClone Red version 2, we confirmed that RC1 was stronger than it had been in rClone Red version 1. It is interesting that RC1 placed upstream of RFP version 2 had medium strength (36% in Figure 11) whereas RC1 in rClone Blue was among the strongest of the constructs we tested (Figure 9). A possible explanation for these observations might be connected to the fact that, for a given amino acid, E. coli uses some codons more often than others. This is referred to as codon usage bias. Researchers who want to produce a foreign protein in E. coli often conduct a process called codon optimization to pick the most frequently used codons to gain translation efficiency (Shin, Bischof, Lauer, & Desrosiers, 2015). Perhaps part of the reduction in the efficiency of translation for RFP mRNA was because the UCC serine codon found in rClone Blue is more optimal (17% usage in E. coli) than the UCA (12% usage) and AGU (13% usage) serine codons in RFP version 2 (Maloy, Stewart, & Taylor, 1996). As with any engineering solution to a problem, compromises must be made such as reducing the stem and loop structure while maximizing codon optimization. Nevertheless, we successfully redesigned and tested rClone Red to be more responsive to strong RBS sequences. In the context of synthetic biology, understanding gene expression allows us to engineer bacterial cells to produce pharmaceuticals, attack cancer cells, neutralize environmental pollutants, and synthesize biofuels (Khalil & Collins, 2010). The Registry of Standard Biological Parts contains over 20,000 DNA parts and devices for use in synthetic biology (MIT Working Group, 2005). We submitted our collection of 65 simple RBSs and 62 bicistronic RBSs as four Registry parts (Bba_J119390 to BbaJ119393). Our contribution has increased the number of RBSs in the Registry from 56 to 183, all of which can be used for the design and construction of genetic circuits that enable bacteria to produce pharmaceuticals, biofuels, and chemical commodities. Various RBS strengths can be used to fine-tune the expression of genes encoding enzymes in a biosynthetic pathway. We also submitted information to the Registry about rClone Red (Bba_J119384) and rClone Blue (Bba_J119389) to make them available to the global synthetic biology research community, including high school and college student researchers. There are many opportunities for mutational analysis of bacterial translation. For example, students could search for anti-RBS sequences in thousands of bacterial genomes to discover new examples of translational regulation (Li, Oh, & Weissman, 2012). 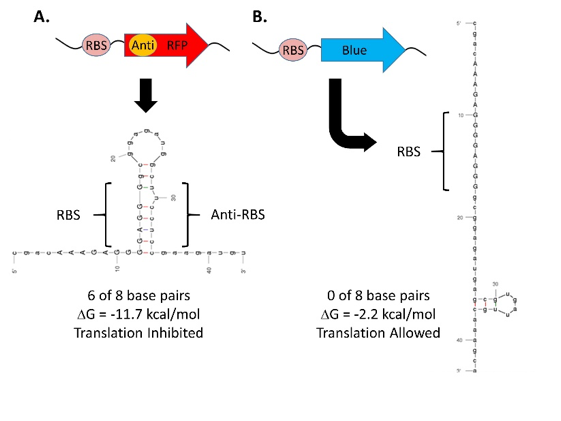 For synthetic biology applications, learning how to disable anti-RBS elements would be important for improving the interchangeability of RBSs and achieving higher levels of gene expression. Another interesting topic for exploration would be the fitness cost of gene expression (Pope, McHugh, & Gillespie, 2010). There is a cost to bacterial cells of producing orthogonal proteins such as RFP and blue chromoprotein. Fitness cost could be measured by comparing growth rates of clones that produce RFP or blue chromoprotein with various RBS strengths. Fitness costs of promoters, RBSs, alleles, and protein degradation tags could be used to determine optimal orthogonal gene expression. rClone Red and rClone Blue are members of a suite of synthetic biology tools that enables high school and undergraduate research students to perform original research on bacterial gene regulation and expression. Each tool leverages the ease with which GGA can be used to clone user-defined regulatory elements and measure their effects on expression of a reporter gene. pClone Red (Bba_J119137) and pClone Blue (Bba_J119313) enable students to conduct promoter experiments of their own design (Campbell & Eckdahl, 2015; Campbell et al., 2014; Eckdahl & Eckdahl, 2016; Eckdahl & Campbell, 2015). tClone Red (Bba_J119367) facilitates investigation of transcriptional terminators that use alternative RNA folding states to control gene expression. We have designed and constructed actClone (Bba_J100204) to study DNA binding sites for activator regulatory proteins, and repClone (Bba_J100205) to study repressor protein binding sites. Each of these tools use the same GGA strategy as rClone Red and rClone Blue to enable students to explore the sequence requirements of bacterial DNA regulatory elements. Our suite of synthetic biology tools is appropriate for high school and undergraduate researchers to conduct original research in bacterial gene regulation and expression. We would like to thank Dr. Jay Meyers of Saint Joseph Central High School for his support and encouragement. Support from National Science Foundation (http://www.nsf.gov/) RUI grants MCB-1329350 to Missouri Western State University and MCB-1120578 to Davidson College is gratefully acknowledged, as well as the James G. Martin Genomics Program at Davidson College. Eckdahl, A. J., & Eckdahl, T. T. (2016). Mutational Analysis of Transcriptional Initiation in Bacteria. Journal of Young Investigators, 31(3), 1–8. van Hijum, A. S., Medema, M. H., Kuipers, O. P. (2009). Mechanisms and evolution of control logic in prokaryotic transcriptional regulation. Microbiol Mol Biol Rev, 73(3), 481-509. Maloy, S. R., Stewart, V. J., & Taylor, R. K. (1996). Genetic Analysis of Pathogenic Bacteria: A Laboratory Manual. Plainview, N.Y: Cold Spring Harbor Laboratory Press. Schneider, T. D., & Stephens, R. M. (1990). Sequence Logos: A New Way to Display Consensus Sequences. Nucleic Acids Res, 18, 6097–6100. Shin, Y. C., Bischof, G. F., Lauer, W. A., & Desrosiers, R. C. (2015). Importance of codon usage for the temporal regulation of viral gene expression. Proceedings of the National Academy of Sciences, 1121(45), 14030–14035. Shine, J., & Dalgarno, L. (1974). The 3′-Terminal Sequence of Escherichia coli 16S Ribosomal RNA: Complementarity to Nonsense Triplets and Ribosome Binding Sites. Proceedings of the National Academy of Sciences, 71(4), 1342–1346.